The Complete Reginald Hudlin, Vol 1 is kinda dope. Very proud. The seven-issue comics adaptation of the Oscar-winning movie by Quentin Tarantino is now collected in hardcover! Don’t miss this blood-soaked tale of a bounty-hunting dentist and his partner Django, a recently freed slave, as they search the post-Civil War South for Django’s wife! 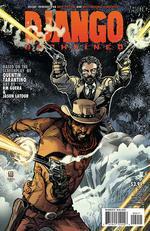 Today sees the release of the Django Unchained trade paperback. The hardcover book collects all seven issues of the comic adaptation of the Oscar-winning movie from Quentin Tarantino. Of course it’s written by Tarantino since it’s the first draft of his script, but it’s adapted into comic book form by Reginald Hudlin. Issues 1, 2, 4, 7 feature art from R.M. 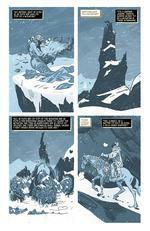 Guera and Jason Latour. Issues 3 and 6 features pencils from Denys Cowan with inks by John Floyd. Issue 5’s art is handled by Danijel Zezelj. Giulia Brussco and Jose Villarubia handle colors while Sal Cipriano and Taylor Esposito provide lettering. The movie was a hit with critics and fans, but how does the adaptation hold up to the source? The story doesn’t deviate too far from the finished project. Django is “freed” by Dr. King Schultz who then offers Django his freedom in exchange for helping him track down and kill the Brittle brothers. Their time collecting bounties forges a friendship and leads Schultz to train Django and offer to help him find his lost wife, Broomhilda, if he agrees to help him collect bounties over the winter. The duo track Broomhilda down to the villainous Calvin Candie, owner of the notorious Candyland. Django and Schultz will have to orchestra their most brilliant ruse yet if they hope to rescue Django’s love. Hudlin adapts Tarantino’s first draft well. Things don’t differ too greatly from what we see on the big screen, but there is a large portion devoted to Broomhilda and her trip to Candyland. The final battle between Django and the white inhabitants of Candyland also goes down a little different than it does on film as well. Other than that, this is really just a great director’s cut of the film. The art is top notch all around. R.M. 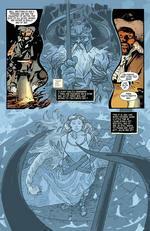 Guera is the prefect artist for this adaptation. 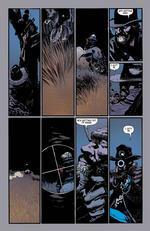 He is probably best known for Scalped, and that was a comic series that was a fantastic Quentin Tarantino-ish film. Guera fits right in with the look and feel of Tarantino’s film. 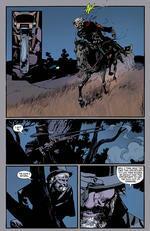 Cowan’s art on issues 3 and 6 are a good compliment to Guera. He has his own style, but the change isn’t drastic or jarring. Zezelji’s art on issue 5 is the most noticeable shift. The heavier line work and use of shading does work well with the introduction of Candlyand though. Summary: Django Unchained is just as good as its movie counterpart. Issue #2 is on stands now….or you could order autographed copies of both issues via www.reggiesworld.com! Django Unchained the comic book available at REGGIESWORLD.COM! So I’m in Golden Apple picking up my weekly stack and who walks in but legendary actor Samuel L. Jackson! We’ve both been going to the same store for years but this is the first time we’ve been there at the same time. 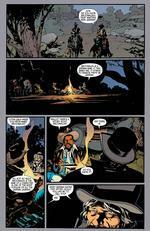 So we shot a little promo for the Django Unchained comic now in stores…or available at www.REGGIESWORLD.com! Reggie Raps with Tom Morello! Guitar God Tom Morello from RAGE AGAINST THE MACHINE discusses music, politics and his new comic book ORCHID.